Millions of people nationwide continued streaming back to big cities mostly HCMC and Hanoi after the Tet holidays on February 20. Of these, hundreds of thousands of people were returning to HCMC. Mien Dong (East) coach station received lot of coaches transporting passengers from the northern and central regions. Deputy director of the station Nguyen Hoang Huy said that on February 20, about 1,400 vehicles transported 40,000 passengers to the station. 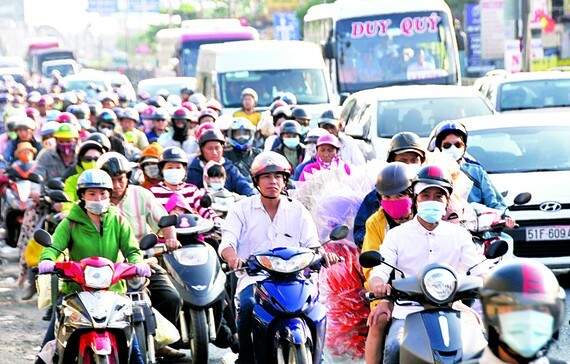 On the same day afternoon, tens of thousands of people from the Mekong Delta returned to the city in Highway 50, National Highway 1A and Nguyen Van Linh street. Most of them traveled by motorbikes carrying belongings and lot of rural specialties. Statistics by Mien Tay (West) coach station show that 1,653 vehicles with passengers estimated to reach 52,000 people. Vam Cong ferry connecting Long Xuyen city, An Giang province and Lap Vo district, Dong Thap province witnessed severe traffic jam because many residents from An Giang, Kien Giang provinces and Can Tho city returned to HCMC and southeastern provinces such as Dong Nai and Binh Duong. In addition, people visiting Ba Chua Xu Temple in Sam Mountain in Chau Doc district, An Giang province also contributed to the traffic jam in the area. The ferry management board must supplement ten of 100-200 tons ferries operating 24/7 but they still failed to meet demand. Saigon railway station receives 20-22 trains a day on average from February 19 to March 2 with the total passengers approximating 14,000-16,000, according to director of Saigon Railway Transport Joint Stock Company Do Quang Van. The number of passengers through Cat Lai ferry, mainly from Dong Nai province to HCMC, has not been as crowded as previous holidays and Tet. Many streets in entrance gateways to Hanoi were congested on the fifth day of the Lunar New Year. Tens of thousands of people flocking to the city after the Tet holidays overloaded traffic system. Traffic jam long lasted in Phap Van-Cau Gie expressway. 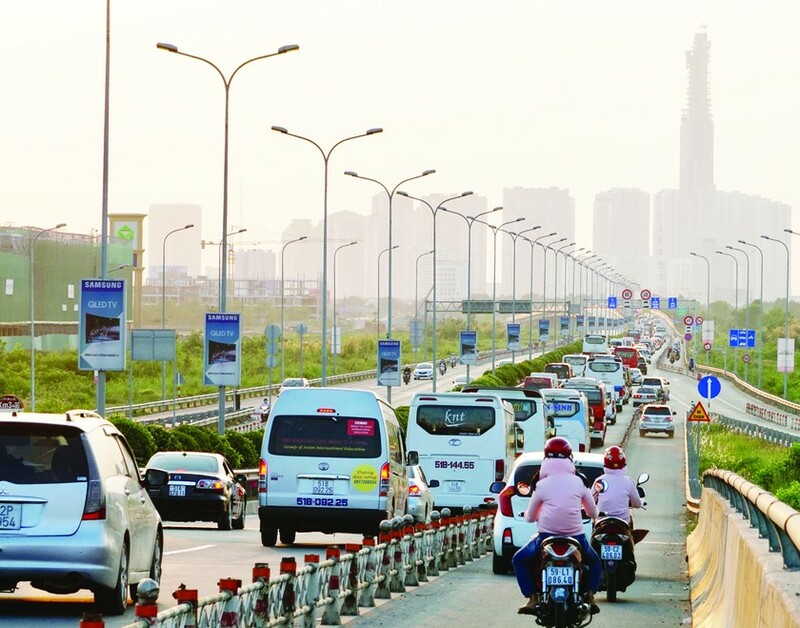 Similarly, Pham Van Dong street, from Thang Long bridge to Mai Dich flyover, was also crowded with vehicles. Hundreds of coaches followed each other to enter My Dinh bus station. Although authorized agencies have intensified inspection but many inter-provincial coaches were still found speeding, wrong parking and overloading. Giap Bat, Nuoc Ngam, My Dinh, Yen Nghia, Gia Lam coach stations and Hanoi railway station saw passengers 1.5 times normal day and chaos in front of the stations. Noi Bai International Airport was very crowded, check in counters were overloaded with passengers this year being 15-20 percent higher than the same period last year. Lot of people from Thanh Hoa, Nghe An and Ha Tinh provinces traveled south or north on February 20. Hundreds concentrated in crossroads along National Highway 1A to catch buses. Many young people travelled to Hanoi by motorbikes. Representatives of Nghe An coach station company said that bus fare increased 30-40 percent on average from the second to tenth day of the lunar new year. It is expected that the station will receive 200,000 passengers during the holiday. Many people disappointed for failing to buy train tickets to southern provinces at Dong Ha, Hue and Lang Co stations as all tickets had been sold out. Mr. Pham Xuan Son, director general of Hue Coach Station Company, said that passengers to HCMC, southeastern provinces and the Central Highlands doubled normal. They are expected to strongly hike on the sixth and eighth day of the lunar New Year.